In the Women's Health Magazine that I mentioned yesterday, I also read that white nails are going to be a trend this season. Do you think there's going to be a lot of white? What colors do you predict will be big this year, or do you think indies will continue ruling the scene with multichromes and holos? I think radiant orchid will be popular, but it's going to be hard for some skintones to pull off. I was drawn to Cirque Lichen today, with it's dark green flecks in the bottle mesmerizing me from afar. It applied like a dream, with its nicely pigmented formula flowing easily onto the nail with no streaking or pooling whatsoever. I used two coats here, and finished with a layer of Poshe/GCS topcoat mix to add shine to the satin finish. Look at all those colorful flecks of green! This was gorgeous alone, but being the holo addict that I am, I decided to add some visual interest with Piper Polish Spectraflair topcoat. I haven't used a topcoat before, aside from one that I made myself a couple years ago and lost in my stash. After applying a coat, I noticed that it dramatically lightened the base color and added a tiny bit of silver sheen. The Spectraflair topcoat is linear, and the holo particles seem a bit on the larger side which produce a strong rainbow effect that is slightly snowy looking, like a tv channel with no reception. This is shown with no additional topcoat. In the pics the topcoat seems to overwhelm the base color, but IRL the green definitely shines through and the topcoat acts more like an accent, as it's intended to be. 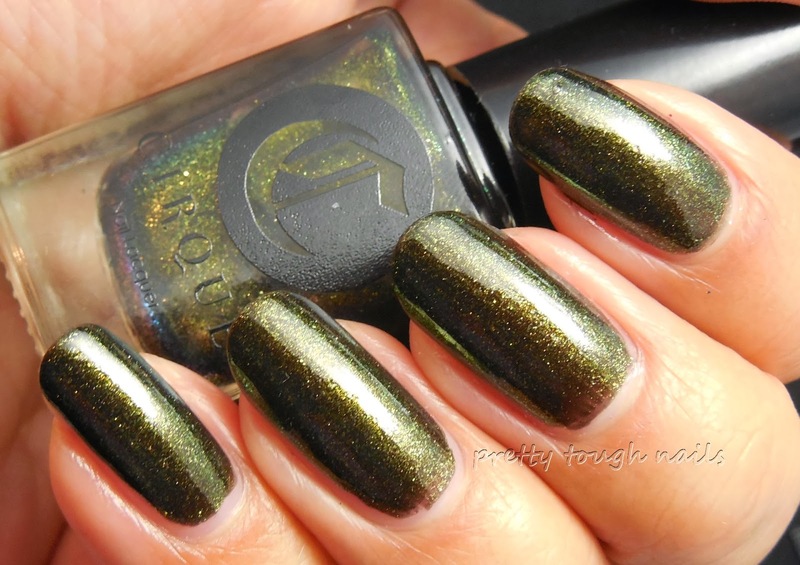 I love a good green holo, and the topcoat delivers that promise when applied over Lichen. The only thing is now I miss those flakes! I guess I can't have it all, can I? I plan on experimenting some more with the Piper Polish Spectraflair topcoat, especially over cream colors. Have you tried any holo topcoats before? Being a newbie to holo topcoats, what makes a holo topcoat a good one? That green is gorgeous but I love the holo top coat you added! It's so pretty. I only have one holo top coat, Candy Lacquer Peyton, which I found in a blog sale. I've only used it over a dark green creme on my nail wheel and I love love how it turned out! I like that it didn't drastically change the base color. Lichen looks wonderful on your kitten claws!